The owners of the Napa Valley Wine Train have submitted an application to the city to build a 348,000-square-foot, five-story resort at the current train station property on McKinstry Street. Such a project will cost an estimated $100 million, said Jake Donoghue, CEO of Noble House Hotels & Resorts. 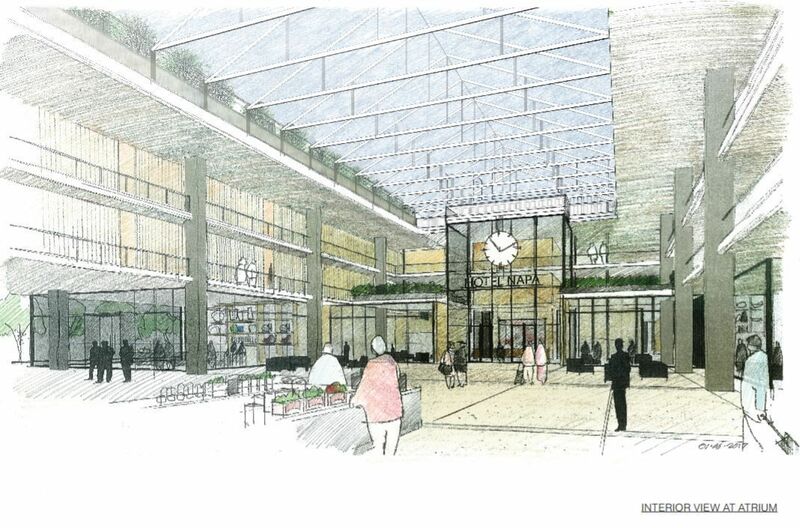 A proposed Wine Train resort on McKinstry Street would include this interior atrium. The three-acre parcel in the Oxbow area would be transformed to feature a luxury hotel with approximately 148 guest rooms, a rooftop restaurant, spa and pool, tiki bar, retail market and enclosed parking to accommodate the train station, hotel and restaurant. According to Napa Valley Wine Train owners Noble House Hotels & Resorts and Brooks Street, the resort is inspired by "luxurious train stations found throughout Europe." "We welcome visitors from across the globe," said Scott Goldie, a partner of Brooks Street. "We feel there’s a need for an elevated hospitality experience in downtown Napa, and now we can offer these individuals world-class accommodations," he said. "We couldn’t be more excited to expand (Wine Train) offerings to include an incredible full-service resort," said Donoghue. 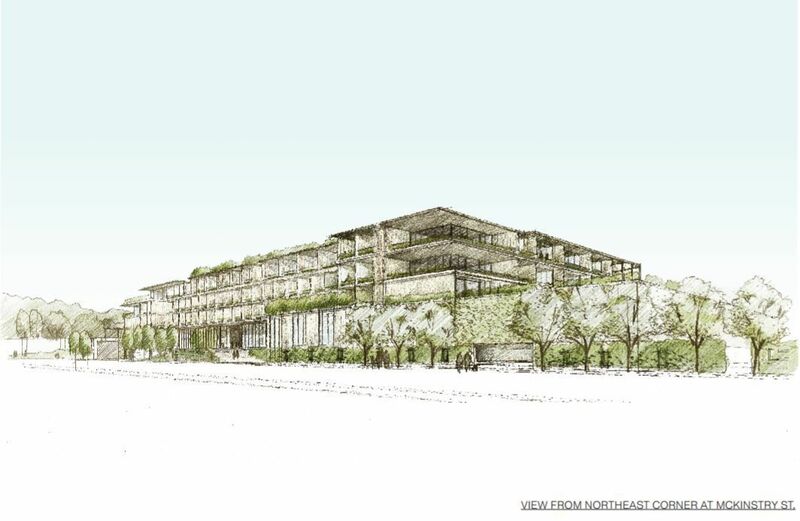 "Public spaces such as the rooftop restaurant and tiki bar that will showcase sprawling views of downtown Napa and the retail space which will focus on local vendors," Donoghue said. According to Rick Tooker, Napa community development director, the proposed resort project on McKinstry Street appears compelling, "given its unique location and combination of uses." From a city planning perspective, "What makes this project particularly interesting is its mix of uses together with its location," said Tooker. The resort will also house Oxbow-style retail space focusing on local purveyors and products, a members-only wine club and an enclosed parking area to accommodate guests of the resort and train station. Designed by Seattle-based architectural firm Olson Kundig, the resort’s aesthetic is described as "rustic and contemporary with natural finishes inspired by the surrounding agricultural and winemaking structures." "The arrival experience will mirror European train stations with a beautiful atrium made of glass and steel allowing an abundance of natural light to fill the space." The guestrooms on the third and fourth floors will surround the internal four-story atrium, which will house the retail market and train passenger lobby. "The simple building structure will act as a backdrop for the remarkable features and views at the rooftop level," said a news release. In 2015, Noble House Hotels & Resorts, Ltd. – a collection of luxury hotels and resorts – entered into a partnership with Brooks Street, a California-based real estate development and investment company, to purchase the Napa Valley Wine Train. Train operations will continue as usual during the construction, according to Donoghue. "We will strive to have very little impact on train operations as we would like to continue to exceed the expectations of our passengers under all circumstances," Donoghue said. The train operators are not anticipating any schedule modifications during interim hotel construction period, but will plan accordingly as the project progresses, they said. Donoghue said he expects the city’s approval process to be approximately 18 to 24 months and construction to take 18 to 24 months. The project has six levels, including subterranean and ground level parking. The first level will feature parking, a café, ballroom, meeting rooms, retail, market area and kiosks. The second level will feature parking and a wine cellar. The third level will include hotel rooms, a roof garden and a lounge. The fourth and fifth levels will include hotel rooms, a gym, spa, lounge, restaurant, pool, roof deck, event space and tiki bar. Unlike the primary pedestrian corridors of First and Main streets that demand storefronts with retail, restaurants, outdoor seating and other vibrant street activity, McKinstry Street is a secondary or feeder street that does not have a particularly strong retail connection, said Tooker. "The application was wise to have a project with a small amount of retail which won’t with compete other existing or planned retail space on First and Main." he said. "What the project also appears to bring to the table, which is important to adopted city policy relating to downtown hotels prioritizing full-service hotels, is creating space for meetings and conferences," Tooker said. This diversifies the experience, which provides longer overnight stays, and which supports downtown businesses, said Tooker. "It also appears to be fully parked, which in the Oxbow District is important given the increasing success of the area," said Tooker. In addition to plans for this new resort, more new lodging options are expected in the city. Archer Napa, with 183 rooms, is scheduled to open in downtown Napa in the fall. Pacific Hospitality Group is in talks with the city to build a total of 253 new rooms near the Meritage Resort in south Napa. Those rooms would be split between a Residence Inn, an extended-stay facility aimed at business travelers, and an AC Hotel, a brand the company promotes to younger vacationers.